or small glasses that can double as vases for short flowers like grape hyacinths. The container does not have to be filled with flowers. individual blossoms to take center stage. grouping three containers together with two to four blooms in each container. but take care not to overwhelm the blooms by too much greenery. The flowers, not the green stems, are the stars in this arrangement. by the brain as one large group instead of three small groups. to the color of the flowers without competition from the containers. Clear vases or jelly glasses would also recede to the background. Add interest to the grouping by using containers with different heights and shapes. Including the sugar bowl lid adds another height to the grouping. more interesting to both sight and touch. Remember that an odd number of items is more interesting than even number. making the total number of items five. Just one small blue speckled egg is all that it takes to add a subtle touch of Easter. 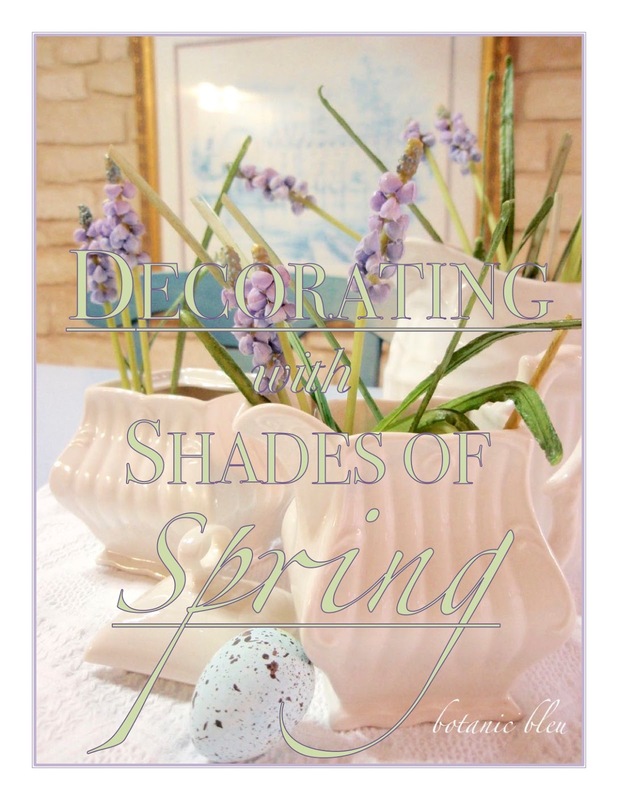 What shades of Spring do you have in your yard that you use to decorate? Exquisite and delightful to the eyes. These images of your decorating are dreamy and I thank you for the information on how to group and how the minds eye views the larger picture. I am heading to the garden store now to see what delights I might find! 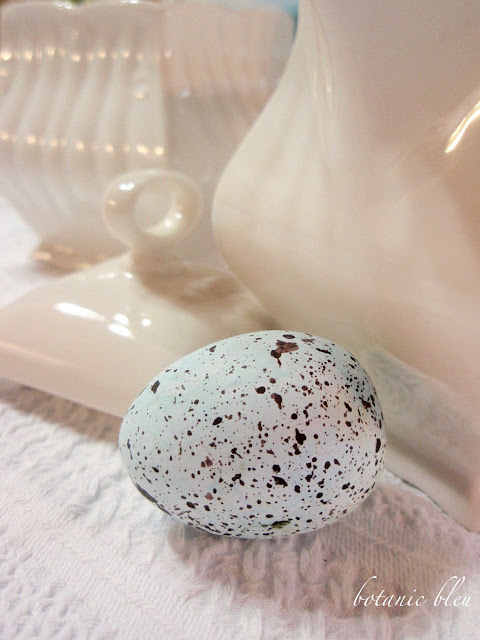 I received my order of these beautiful ceramic eggs from your shop yesterday! Thanks for yet another great idea for decorating with them. Thank you for your order. 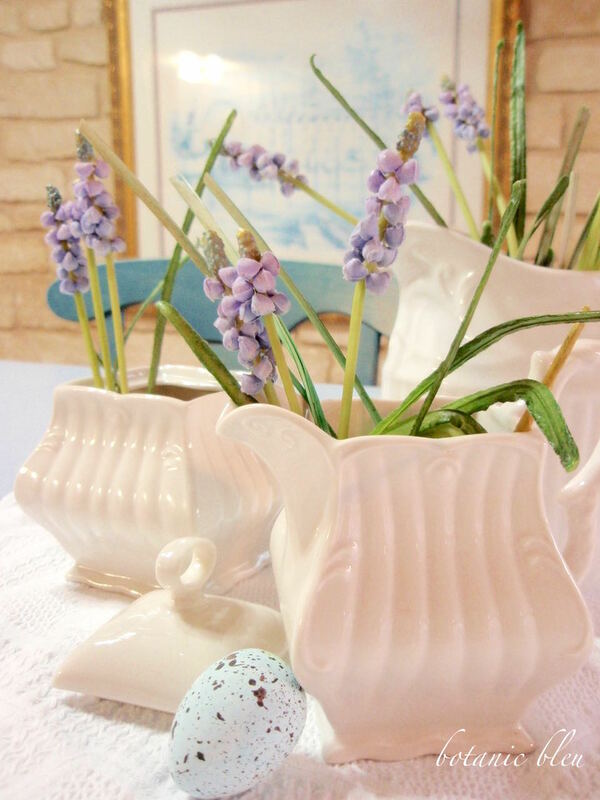 You will have so much fun using them for Easter decorations. If only you could see me trying to take photos in the kitchen battling the artificial overhead lighting and the massive amounts of natural sunlight streaming in through the sunspace. Our little secret... lots of editing the lighting of photos in my photo editor. I adore your white. What pattern is the sugar and creamer? 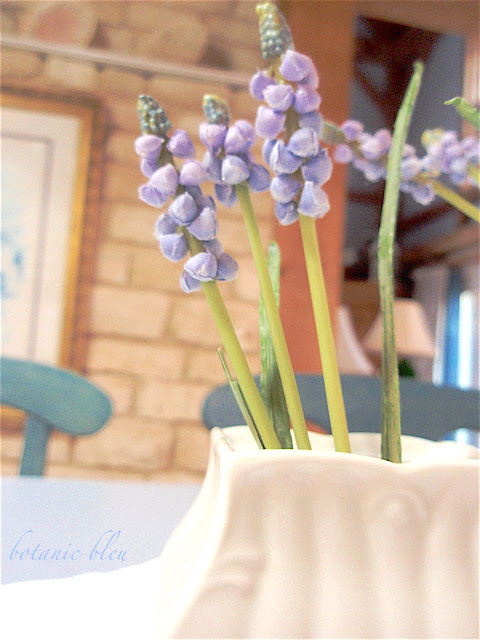 I love grape hyacinths. Happy Saturday. The sugar and creamer are from HomeGoods and the pattern name on the bottom is Grace. 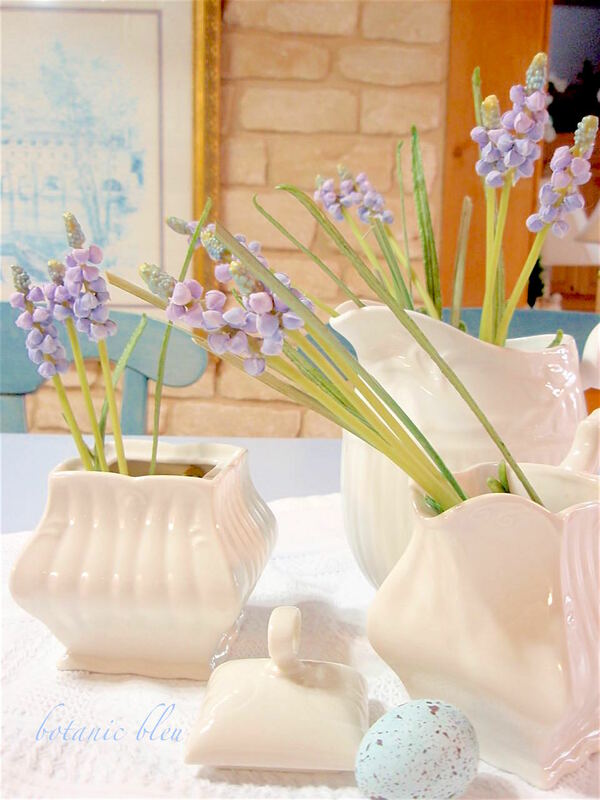 Your pictures are so pretty and I love the white pots. Thank you so much. Since I began blogging I have developed an addiction to white. Thank you so much for your encouraging comments, especially letting me know you are a long time follower. So glad you enjoyed this post and others as well... You made my day! 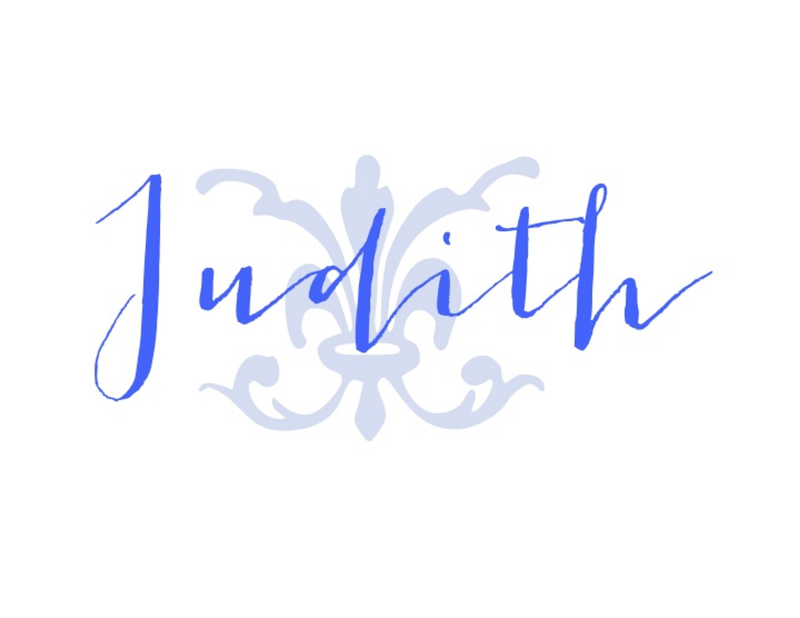 Judith, our white pottery is so pretty for many things. I went out to cut some redbud branches today, but I'll need a ladder if I'm to get any. I didn't realize the tree was so tall. Thanks for this cheery post this morning. Enjoy the weekend! How wonderful to have something blooming to bring in! I do love your arrangement ~ so bright and cheerful! 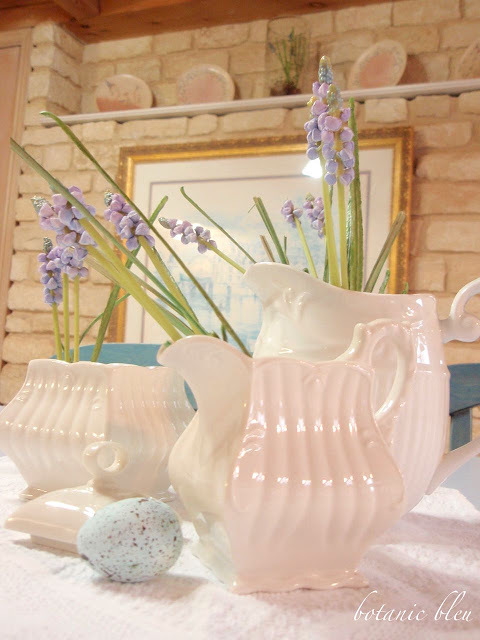 Such pretty vignettes. I like the idea of stretching the impact of flowers by spreading them among a few interesting vessels. You really are an amazing decorator. I feel like gushing every time I see a post you've done because it's always, without fail, beautiful. Each of your pictures is beautiful and you are so right - decorating does not need to be elaborate or expensive. 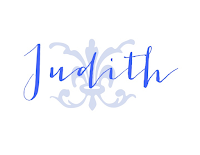 Just found you through the party at Savvy Southern Style and I love your blog! I am a French Country fan as well and am going to bop around and read more. Love this post and especially the white pitchers!